So to begin this post, I have a video on a little background behind not only Cecil, but the fictional world he inhabits that is Nightvale. It’s entirely possible to understand this post without watching or knowing the show, but some references might be a little confusing. 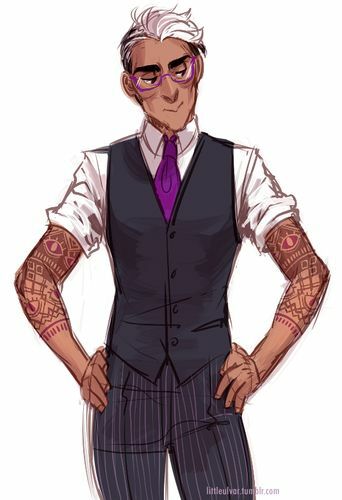 So now that you’ve seen that, let me begin by starting with how I picture Cecil. As mentioned above, he has no defining characteristics, but there’s tons of fan art on the internet with various people’s images of him. There’s a few trends that I don’t see in my mind’s eye, such as a third eye on his forehead, but the images scattered throughout this post represent how I see him. I see Cecil as a man in his early to mid-30’s, of european descent, with naturally dark hair that he dyes to silver on a regular basis. 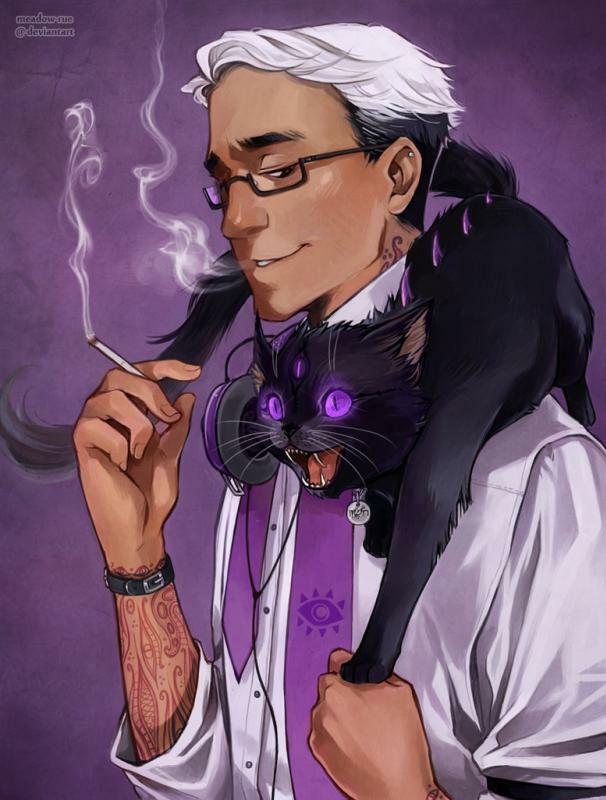 A common theme in fan art is to have him wearing a white shirt with purple tie, and 50% of the time wearing a gray suit vest. I see all of these things about him. Almost always in fan art he has tattoos and/or piercings. I can see him having some tattoos not visible under his work clothes. Cecil has led an interesting life. 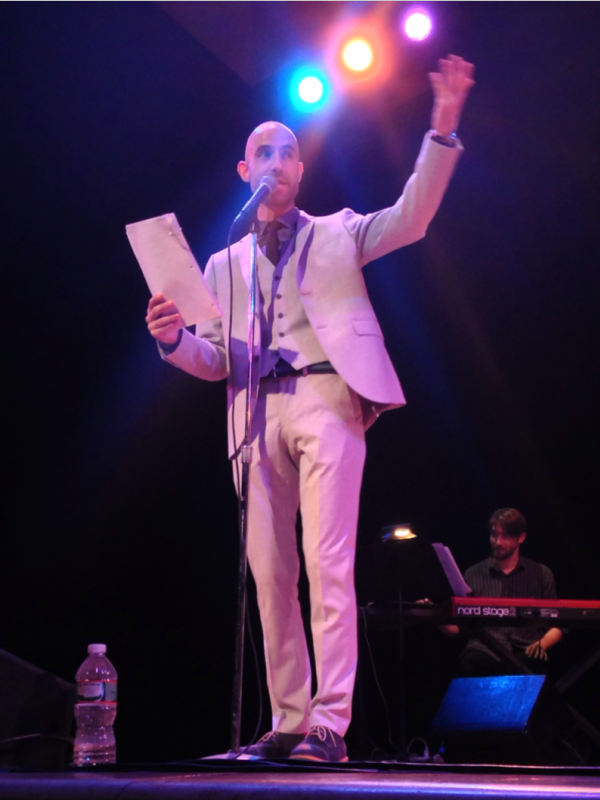 He is the voice of the show (Welcome to Nightvale), as the announcer for Nightvale Community Radio. At times, Cecil will report on events as they are occurring. It is mentioned he often receives faxes and phone calls from listeners on events, as well as updates from his surviving interns out in the field. He lives in an apartment of currently unknown location in Night Vale and is also mentioned as owning a car. He is very friendly and cheerful, and appears to be well acquainted with the folks around town. He is very fond and proud of the town, familiar with its intricate history and set of normalities, many of which differ from our reality (and much of the show’s entertainment source). Cecil has been on several adventures over the course of the show. Occasionally he will go “on location” and report from the scene of the action, as opposed to his studio booth. Cecil, as a self-proclaimed journalist, has no obvious political or religious leaning. While he almost always is quick to praise the City Council or the Sheriff’s Secret Police, he is also not afraid to call out crooked politicians for their wrongdoings. A far more extensive bio (and my source for some of the wording in this post) for Cecil can be found here. What about Cecil inspires me? Much of my inspiration comes from Cecil’s loving personality, and the pieces of him that I’ve presented already. Cecil is currently in a relationship with Carlos, a scientist at appeared in town in the pilot episode of the show, though they didn’t start dating until a year into the series. 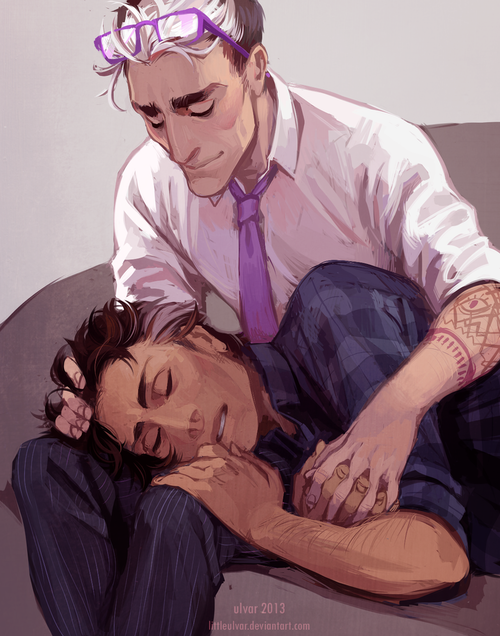 Cecil has often commented on how beautiful he finds Carlos, and many positive things he likes about Carlos. I see myself as having a personality base similar to Cecil’s genial manner. I see Cecil as very grounded and logical, two traits of which I spend my time trying to emulate. Cecil cares very deeply for the town as a whole, and I feel the same way about where I am – I am very proud to call myself a Vermont resident, since I researched the area and spent time fighting to get here. Cecil’s relationship with Carlos is a reflection on my newer views of relationships, or my take on “modern romance.” I find the first 26 episodes of Cecil announcing his interest on air to Carlos, then the events of “One Year Later” so beautiful. I literally teared up when I first heard the worry in his voice during the episode. I felt my heartstrings tug as he talked the audience through Carlos’ admitting of his feelings at the Arby’s. The relationship Cecil has with Carlos is how I see my next relationship functioning. Even though I’m skeptical about this phrase as a longtime Dan Savage listener, it would make me so happy to say “And I fell in love instantly” about someone. Cecil’s passion for his community, and his style of dress (as imagined by has fans in their visual art depictions) are other pieces of him that I want to emulate. The following is an image of the voice actor who portrays Cecil on the show and in live stage performances. The actor, Cecil Baldwin was interviewed in the blog, Dining With Strangers. Great insight into the man behind the voice before he was Cecil Palmer. In summary, Cecil is the kind of person that I want to be about 7 years down the road. He’s comfortably started in his career, happily in love, and always growing as a person. Thank you Cecil, for being an inspiration!